Cooking is an integral part of everyone’s life. For some people, this is a rewarding hobby that they enjoy thoroughly while others find it a chore. But regardless of the interest of different people, what you need or which is absolutely important in your kitchenis a sharp knife. Having an electric knife in your kitchen is a smart investment. Why would you call an electric knife a chef’s delight? This particular statement places huge expectations behind the product but this is pretty much true that the product can be chef’s delight if properly used and carefully chosen. The qualities of an Electric knife that made it popular among the cooking enthusiasts is surely its sharpness, thinness and flexible blade. They are constructed with the high-quality strong steel that can reach easily the inner portion of a fish or meat that no other ordinary knife can reach. Secondly, an electric knife can minimize the effort of a chef to cut a fish. Next, it also makes the chef’s life much better because they do not run the risk of the knife cutting or slipping into their hands. Lastly, the electric knives do not require any additional sharpening process like the normal knives. These features make the electric knife a supreme product and an unavoidable part of any kitchen. Handle gets hot while working for a longer time. Cuisinart is surely a top brand that focuses on providing the best quality kitchen appliances. When you are buying Cuisinart CEK-40, you will get complete quality assurance from the brand. To deliver a high level of performance, this knife comes with two powerful stainless steel blades that can tackle any tough cutting job in your kitchen. You can find one bread blade for the simple tasks like the crusty baguettes and another is a carving blade to produce a restaurant like clean cutting experience. It is useful not only for professional cutting but this knife is ideal for cutting or slicing the loaves, meats,andvegetables. To suit both the left handed and right handed cooks, Cuisinart CEK-40 accommodates a fine ergonomic handle. You can make your cutting process more elegant with butcher-block fine quality storage tray that is made of solid wood and comes with the safety-lock system. Your storage may look stylish definitely with the system. 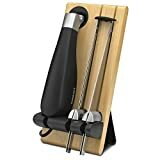 Whether you are making tasty dishes for friends gathering or just making a delicious breakfast for your family, this can bea top-rated choice for you as it lets you fulfill all the cutting needs of a kitchen commando. One touch pressure controlling button is another amazing feature of the knife. If you are looking for an ultimate cutting solution for your kitchen, Black+Deckeris the ideal choice as it comes with best of quality assurance. From ironing to baking, this knife can cover everything. The comfort and easy grip of the knife are excellent features. It helps you to slice the bread and meats effortlessly. To cut various types of foods, the high-quality stainless steel blades are impeccable. When you are busy in your chopping work, safety comes first and with the safety lock feature of the knife, you will get thebest performance without any injury and you will be able to enjoy your own peace of mind. This is also free from any cleaning hazards as most of the parts are dishwasher safe and easy to clean. Looking for large size longer blades? BLACK+DECKER is surely a search-end product for you because itproduces a smooth cutting experience that may wrap up with an even slicing result. This high-quality knife does not need to be sharpened. During your cuttingtask, you will get essential control and comfortdue to its ergonomic handle. One press easy blade release switch can help you with an easy removal. This is now quite easy to make your holiday binge more delicious and impressive by giving it more precision when it comes to cutting. If you want to slice or cut your favorite meats, artisan bread, cheese to create the deli classic at your own home, this knife from the renowned brand Hamilton Beach allows a simplified process for you. The handle of the knife is perfectly designed to give you an easy grip and it also allows you for precise cutting with less effort. You don’t need to sharpen the blade for precision cutting and easy removing method is good for faster cleaning. Stainless steel fine fork is justified to make a flawless process of carving to smart serving. You will get a storage case that keeps everything together in a single place. Oscillating fine double blade, powerful knife simplifies any kind of cutting task. It not only save you from your hard effort but the knife can help you save your time as well. You don’t need to compromise with the texture while slicing the bread because this product is committed to offering a precision cutting experience with ease. Yes, you are completely safe from any accident or injury while you are using the electric knife because the handle gives you excellent control. People, who value an effortless, easy cutting, this is one of the best knives available in themarket. Cleaning and preparing fish is always a cumbersome task, especially if there is no proper equipment to complete the task. Filleting fish requires more time and effort and it can be quite messy if you are doing it with a wrong knife. American Angler Professional Grade knife is made for this specific task and they come in an impressive design to make your cutting job enjoyable. If you want to use your knife for professional work, this is really a commercial grade electric fillet knife to add to your collection. You can now say a happy goodbye to the old, traditional, short-lived, low powered knife and can move to enjoy the precision, power, and durability with this high capacity electric knife. To cut the fish like a pro, this is one of the best electric knives that designed especially for the fishermen. The motor of the knife can boast more torque than the other available electric knives. It comes with the ergonomic handle that makes the cutting process easier for the beginners and also for the seasoned fishermen. This is surely a commercial trade knife that coupled with a flawless design. Don’t be worried when it comes to cut lots of fishes at a time to cook after catching it fresh because Mister Twister electric knife is vastly available in themarket to solve all of your tension. This is a professional level knife that designed with the piercing and powerful blades. These blades are really convenient to make aprecise fillet of the fish before seasoning or cooking. The quick release convenient mechanism and a smart safety lock make it more appropriate for theregular cutting job. Heavy duty powerful motor is best for long-term use. If you are looking for a durable and powerful motor, high impact, high-quality motor of the knife keeps is protected always from any bumps or drops. This is quite lightweight to give you relief from your regular task of fish cutting and the comfortable handle can save you from any injury during your cutting task. With the knife, you will get a curly durable power cord, which is best for filtering out the fish on the docks. Mister Twister is the right choice to make a fisher man’s life easier and it is an excellent tool for the regular use of a fisherman. For some people, looks of the productcome first while shopping the kitchen appliances. Proctor Silex 74311 can come at the top in this category. This electric knife comes with an elegant yet very simple design to add to your modular kitchen. This lightweight slicer is coupled with contoured handle, stainless steel sharp blades and a fine touch control button that allow the product for the simple operations. For your kitchen, this can be avaluable appliance to curve and slice the meats, bread,and vegetables. You can call this knife a smart device than a cutter as it comes with a fine set of sharp stainless steel blades. Just plan your Thanksgiving party or birthday party with your friends if you have the master cutting solution for you. Long blades are good to slice the turkey, ham, fish, roasts, bread, etc. The small and comfortable grip is good for easy holding and the trigger button is also located at the handle. Proctor Silex 74311 is equipped with all the smart safety feature to make your cutting process easier and faster. This is pretty much simple to maneuver. Hamilton Beach is another popular name in the industry of kitchen appliances. This smart looking electric knife can make chopping of the meats and bread incredibly easier. 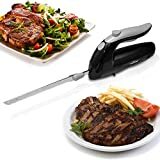 If you always have hated cutting up the meat, you should get this electric knife to speed up the process with minimum effort. You can slice the meat in a few minutes thanthe time it takes with the normal knife. You can get the Carve ‘n Set to help with the filtering. You can use the knife to cut any sort of meat and quite faster. It may help the cook to cut the roasts and the roasted poultry quite faster and in an easier way. The dual serrated fine quality stainless steel blades can move easily back and the front to cut the difficult part of the meats or fish. With proper instruction and proper way of usage, you can slice like a professional with the knife without any type of mess. It comes with astorage case that keeps the fork, blade and the knife easily accessible and protected in a single place. If you are ready to cope up with any type of filleting task, the new Rapala Lithium Ion electric knife is among the best that produce an 80 minutes continuous run time. It is coupled with the Lithium-ion batteries that offer you a consistent speed and high torque performance without any power issue. 2 hours of charging time are enough to run 80 minutes constantly. You just don’t need to worry about the horrible sound of the motor because the smart design of air flow keeps the motor quiet and the high-quality motor is ready to serve you for alonger period of time. Easy and relaxing grip allow you for a secure and comfortable grip. Reciprocating 7” blades are just perfect to speed up your filleting task and offer you aaccuracyin cutting. It comes with a 110V AC charger for the battery. What should be much better if you get a perfect combination of versatility and performance? Large size blade and powerful motor comewith a superb compatibility to make your slicing task easier and faster. With the knife, you will be able to save your time and at the same time, your efforts as well. Serrated blades allow you to a calm and finest cutting action. This is a dishwasher safe knife and easy to clean up after anaccurate cutting of meats and bread. Nonslip, ergonomic handle gives you an easy grip and simultaneously, the one-touch off/on control system makes the knife easy to operate. Well, in the market for cordless electric knives, this is one of the best knives that come with a 5-foot long cord. Easy control grip of the handle makes it quite easier to handle for both the left and right-handed users. Black & Decker is an eminent name in the industry as it provides the best electric knives and this brand is committed to offeringthe high-quality products every time. Serrated stainless steel 9’’ offset blades are ready to give you a rapid and smooth cutting experience. While you are slicing the meats, vegetables, bread or the craft foam, make it your best companion and enjoy a balanced and flawless cutting experience. It comes with the fine quality ergonomic handle to give you supreme grip and control. Perfect design and premium material of the handle is good for comfortable gripping. You can remove the blades as per your requirements and will be able to clean them in thedishwasher. Safety lock button of the knife is an excellent feature that prevents the electric knife to turn on when it is plugged in. There you will also find the blade release super button for easy removal of blades. Electric knives are among the least understood kitchen appliances becausepurchasing a substandard electric knife can leave folks with a bad experience. Many people have even never used an electric knife and don’t understand why they would want one. In short, electrical knives are far superior to the standard knives for a lot of purposes. This is a majorly important tool for the fishermen to cut the fish precisely and flawlessly. A high-quality electric knife should come with two removable blades. Importance of having two removable blades is the simultaneous slicing motion in opposite direction. The best feature of an electric knife is its ability to slice various foods without damaging or misshaping them. You can avoid such disasters every time when you cut a stuffed meat. There is a chance for the stuffing to spill out every time when you try to cut a piece of pie and endup with the slice that so mangled and hardly possible to recognize as a slice of your favorite pie. Those things are obvious while you pull or push the knife simultaneously and pressing down forcefully. Having two blades moving opposite direction means you don’t need much effort but just press down with limited force to get a precise slice of the pie. You can get some pretty good quality electric knives inexpensively but there are some problems with the standard electric knife, the cord obviously. Either you need to find a model with enough long cords to reach each corner of your kitchen or can go for another solution, that is, the cordless electric knife. Consider the weight of the knife as well. There are some knives that areactually heavy and the persons who are using it will find it really tough to use. It is better to buy a lightweight electric knife that is quite easy to handle and useful for every person. A convenient handle is always preferable. It should notbe much large or not too small. You need to see your compatibility with the handle before buying it. Ergonomically designed knife and handle can make the using method easier for everybody and makes your life trouble-free while you are using it in your kitchen. Nothing is simple and while you are going to buy a good quality electric knife, you have to consider a lot of things. Another feature that you need to consider is the power. There is anumber of cordless or corded models that come with weaker batteries or the batteries that do not last for a long time. This is the key point that you need to research more, from one model to another. You can avoid some low-quality models by researching on thenet. It is better to deal with an ergonomic design of the electric knife. Good power and torque of the motor allow the user’s for faster cutting. It is always good to deal with a reliable and good brand while you are buying the electric knife. Consider the length of the blade before buying and it will depend on the types of the foods that you are going to slice. There is the fillet or the carving electric knife that you can choose as per your necessity. Keep in mind the safety features first while you are purchasing the electric knife. Electric knives are available in two different power choices, battery operated knives and the electric ones. If you are looking for the portable one, you should go with the battery charging knives. Before purchasing one, check the quality to enjoy better performance. Care for your purpose and understand why you are looking for a professional level knife or just for your regular cutting work in your cozy kitchen. You can check the consumer reports or can read the reviews readily available over theinternet. You will surely find some solid advice with the process and will be able to buy the one that comes according to your requirements and designed with best quality materials. Good electric knives don’t be cheap but with a good analysis or research, you will be able to buy a good quality and reasonably priced product. It will make your life a lot easier inside the kitchen.